Rock Bottom was our first room at the Madonna Inn. 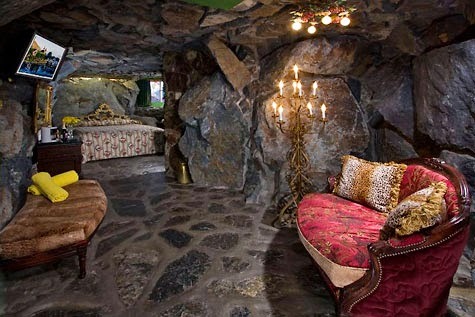 It's like an actual little cave with a rock cave shower as well with a waterfall that falls on your head. I love this room and I love this hotel. Madonna Inn is incredible, you must go stay there. I have a ton more blogs featuring Madonna Inn and our next room and details. It was such an incredible fun time. Right when we got there we both ordered Mai Tai drinks by the pool. I hadn't drank any alcohol for over 2 months so it was a bit much for me, but SUPER yummy. I suggest ordering drinks by the pool for sure.